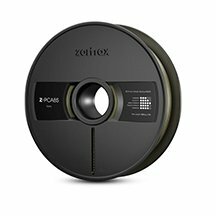 Zortrax's Z-PC-ABS filament is specially designed for coatings and prototypes. It is very resistant as it is composed of an alloy of ABS and polycarbonate. This filament is best used with the Zortrax M200 printer. PC-ABS is part of the Zortrax’s filament range, this filament allows Zortrax M200 holders to print a filament made of ABS and polycarbonate which will make very solid and resistant objects. Each Zortrax filament is specially developed to work with the Zortrax M200, this ensures high filament quality, but also avoids compatibility problems. With the Zortrax Z-PC-ABS filament you will be able to carry out prints with a high success rate, you will not have to worry about the printing settings as the printer manages them itself according to the filament you will be using.